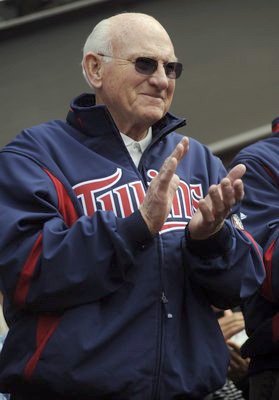 When the Minnesota Twins faced the New York Yankees for the first game of the American League playoff series at Target Field on October 6th, the honor of throwing out the ceremonial first pitch of the game went to arguably the best known and most beloved player in the history of the twin city franchise: Hall-of-Famer Harmon Killebrew. Click here to see what Harmon had to say about the day. Joining “The Killer” at the pitchers’ mound was a more recent, but equally well-liked member of the both the Minnesota family and the 500 Home Run Club, “Big” Jim Thome. 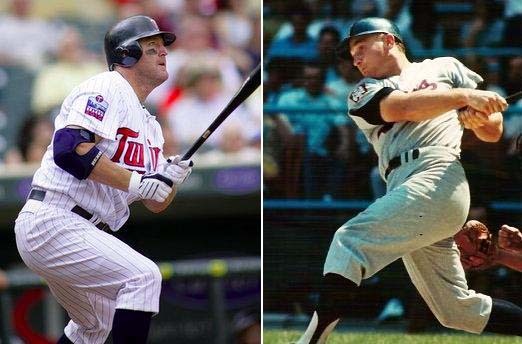 Despite their menacing nicknames, and the fact that Thome surpassed Killebrew for 10th place on the career list with his 574th long ball on Independence Day, the two men had nothing but kind words and admiration for one another as the current (and future?) 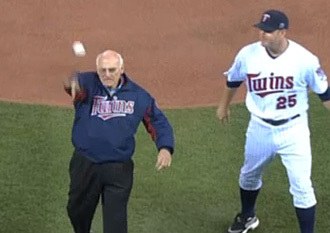 member of the Minnesota team delivered the ball to Twin icon at the center of the Target Field diamond. "I talked to Jim quite a bit during spring training," recalled Killebrew, “and I told him, 'Don't feel bad if you pass me up, because I passed up a lot of guys in my career.’"
And the feeling is mutual for Big Jim, who grew up hearing about Killebrew’s exploits on and off the field. “My Dad always used to talk about Killebrew. It's kind of a neat story because my dad told me about two different times when people thought he was Harmon Killebrew. Fans actually approached him in Dodger Stadium last year asking for his autograph. These days the Twin sluggers have struck up a friendship based on mutual admiration. “To meet Harmon and get an opportunity to be with him in spring training and -- I mean he's a legend, he's a legendary person, too -- that's what makes it even better,” said Thome. “That's something that will go down in my book as one of the better moments in my career, for sure." And Killebrew, who has famously spoken out regarding his concerns about the impact of performance enhancing supplements on America’s game, had nothing but good things to say about his younger protégé. "I had met Jim Thome before he joined the Twins, and I've always respected him as not only a great baseball player, but a wonderful man," Killebrew said. "So, getting to know him better this year, it just put icing on the cake. He's done a great job for our ball club, and I wish we would've had him several years ago." Thome too would like to see his name penciled in on the 2011 Twins’ roster. In fact, he recently told the Minneapolis Star-Tribune: “I love the game. I'd love to come back, I really would, and Minnesota was a great place [to play], so we'll see how the winter goes. It would be great." So with any luck, the 40-year-old Thome will be returning for his 21st season next year, when he will grow closer to Killebrew as a friend, even as he continues to distance himself from his hero on the all-time homer list. Editor’s Note: After surpassing Harmon Killebrew’s 573, Jim Thome’s cruised by Mark McGwire’s 583 and pulled even with Frank Robinson at 586. Next up: entry into the 600 Home Run Club and a shot at Sammy Sosa’s No 7 spot at 609.